BD: Thank you for taking the time to talk to Bluesdoodles. 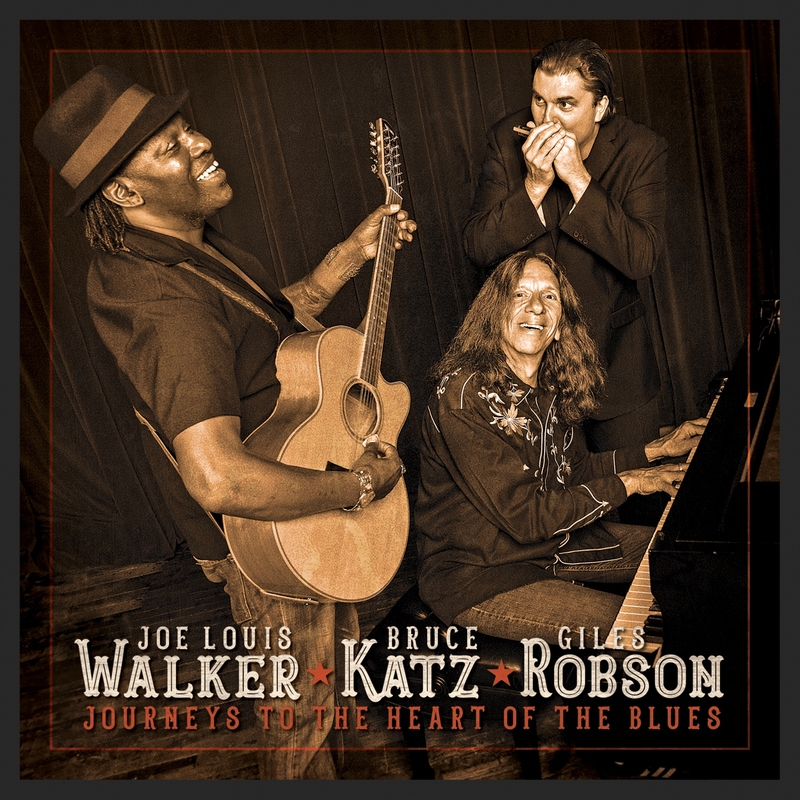 With the launch of your album Journeys: The Heart of the Blues a collaboration between, Joe Louis Walker, Bruce Katz & Giles Robson and a tour the three of you are definitely busy. Munich Records proudly announces Journeys The Heart Of The Blues, a dynamic new acoustic album by three of the best blues musicians of our time. Together Grammy-winning guitarist, vocalist and Blues Hall Of Famer Joe Louis Walker, virtuoso pianist Bruce Katz and British harmonica wizard Giles Robson The trio’s album is released simultaneously in North America, Australia, New Zealand and Japan by Chicago’s legendary Alligator Records, whose glorious 47-year history has recognized the label as the world’s best blues record label. The official release date, set for the autumn, will be announced shortly. BD: How did the three of you get together to record Journeys The Heart Of The Blues, an acoustic blues album combining, guitar, piano and harmonica. GR: Joe and I jammed together during his set at the Amstelveen Blues festival in Amstelveen Holland in December 2016. It was a great experience and we talked about the idea of working together in the future. I was listening to a lot of acoustic blues albums whilst on the road that year by some of the classic blues artists that usually recorded with Electric bands – Junior Wells, Buddy Guy, Muddy Waters, Sonny boy Williamson and the idea of recording something similar with Joe formed so I contacted him several months later……. JLW… it’s the way Giles laid it out. Except when he approached me it was just an idea of him & I. I suggested another instrument, and Bruce Katz came to mind because Bruce played on a couple of my CDs, as well as numerous other artists, and his own band etc. Also, Bruce is well steeped in this era of Blues. So it worked out because without Bruce it’d be a very different project. His piano playing is simply fantastic. BK… Like Giles said, he got in touch with Joe who got in touch with me. It’s a great trio of people, both musically and personally. I’m so glad to just play acoustic piano and have all of the breathing room and flexibility that playing real acoustic blues provides. BD: The album produced by the three of you, were there any challenges in this collaboration of three musicians’ with your own personal sense of direction for music. JLW… The challenge for me, as it always is, was to get inside the songs, to have my vocals get across the meaning, emotion and punch line of each song. It’s more than simply singing & playing. It’s doing it all and making it ALL believable. And making it fun. Also, learning all those lyrics in such a short amount of time was a challenge. BK I’m very historically oriented in my appreciation for and performing blues (and jazz, for that matter) music. I was playing boogie-woogie and barrelhouse piano when I was 12 (I was a weird kid!) and I love to return to the blues of the ’30s/’40s’50s. My original music is a hybrid of styles but I really enjoy delving into the purity of this music. BD: How did you achieve the sense of intimacy and warmth in a studio, during an icy cold New York Winter? GR: I guess out of the three of us this weather was the biggest shock for me. 12 inches of snow, -22 degrees temperatures. It was something I’d never really experienced before. But once we started playing together we got a great chemistry going and the results speak for themselves. BK…I’ve lived my whole life in either freezing cold Boston or NY so none of that bothers me! BD: The album, Journeys The Heart Of The Blues is eleven stripped unadulterated rare and classic blues songs and a new instrumental. How did you go about selecting the ten songs that made the final journey with the three of you? GR: We all came to the table with songs. The idea was to look back and unearth tracks with striking lyrics and feels and basically do them our own way. One of the classic blues’ major strengths is its lyrics. Tough-talking, ironic humorous and based on real-life experiences and situations. I think all the tracks celebrate that – with our own musical spin rooted in the musical traditions of the music. JLW… It was mostly Giles ideas for topical songs. And Bruce and I contributed a few selections. BK…Giles did want us to look for songs with lyrical meaning to them. And Joe and Giles found some amazing ones, like Poor Kelly and Murderer’s Home….heavy tunes! GR: Well for me on harp – the usual suspects – especially Sonny Boy Williamson, Little Walter, James Cotton, Junior Wells They all gave so much to what they were doing in terms of individual style, technique and soulful feeling. I still find what they achieved really incredible. JLW…. for me, I luv them all. If it’s a song that I feel, and if it has a good topic, musical interest and punch line, then that’s my favourite. Until the next song comes along that moves me in that way. BK – Yeah, I love them all as well… Jazz Gillum doesn’t get his just rewards in the modern era. And to play Big Maceo’s Chicago Breakdown was something I always wanted to do but never got around to….but I have now! BD: How do you feel blues has changed over the decades? With the changes has the raw essence of the original masters been lost or merely diluted? GR: I think its changed and developed to fit the needs of the audience that’s changed and developed. But from my experience – pure classic blues if played right and given enough effort and fresh feel and thinking still really works as a living breathing music for live audiences and CD listeners across the world. JLW… Demographics, worldwide recognition, more everything, from more women to everyone in the rainbow … playing The Blues. I remember when it was basically a bunch of older Black men like my dad, and my father would play records by them. Now there’s a diverse side to the Blues that wasn’t there when I was a kid. Which I guess is good to keep The Blues from becoming a museum article. But that hopefully won’t take the essence of The Blues and morph it into something we don’t recognize as Blues. Hey, nowadays they even teach Blues at university in some places. Which shows the respect Blues has garnered. And the credibility that comes with playing and having lived The Blues, as some us have. BK – I’ve actually taught Blues History and performance at the Berklee College of Music in Boston. So I can tell you that it’s being studied…in fact, one of my students ended up playing in Joe’s band for several years! (One of my success stories!). But seriously, the music is still there. Yes, some people don’t “get it” and lose the essence of the music but there are plenty of folks that still have the feeling…but are helping the music grow. Like Joe says, we don’t want Blues to become “museum music”. Don’t forget, Muddy Waters was a revolutionary! BD: The three of you are touring the album with selected towns and venues in Europe and the UK. Are there plans for further dates? BK We certainly hope so…nothing specific, but I’m sure we’ll be back out there. GR: I guess for harp players the holy grail of historic live gigs would be to see Little Walter playing live in his prime through an amplifier in a Chicago club. That would be for me. BK – I don’t know who I would take, but I would have liked to see Ray Charles at the Newport Jazz Festival in 1960!